Today is the day of much chocolate and roses for many across the land. Of store bought cards that whisper sweet nothings or of cute little ones with cartoon characters on them and a candy taped to it. There will be many – hopefully – romantic dinners be they home cooked or out at a restaurant. It is also a day when many who decry the commercialism of the day and refer to it as a pagan holiday wave it off and go about their day like any other. Those who are single will either go out and celebrate the Un-Valentine’s Day with friends or will stay at home and bemoan the one that broke their heart, that they do not have a sweetie, or raise a glass of wine to themselves and carry on quite well. There are also those who are alone due to time and tide, wars, age and illness. They may cry softly or look through old photos and recall fondly Valentine’s days past. If you know of someone who is alone or sick, give them a call or drop by to say hello if you can. I will be in the past and present today. DH is getting one heck of a dinner prepared instead of us going out (Yorkshire puddings with gravy are on the menu tonight) and a handmade card with a chocolate taped to it. My thoughts are taking a stroll down the street called Memory Lane where I recall fondly how when I was a girl in elementary school we decorated shoe boxes in class to have our classmates put the cards in. If you were really lucky you had a classmate who could afford to tape a candy to the card. We also made cards for our parent/s with the always classic white paper doilies. How many moms still have those cards? A very sweet thing my father would do – besides making good and sure mom got a box of Mavrakos chocolates – was to get me a little box of those silly but sweet candy hearts that had the sayings on them or a red heart shaped lollipop. He told me his two “girls” (me and mom) were his Valentine’s. I so wish I could find one of those lollipops. Talk about happiness on a stick with a red tongue! The cards and presents have changed as I have grown. Now I’m thrilled when I get a scribbly card from the grands and my present of choice now is anything having to do with photography. So whatever your day may hold, whether you will be partaking in any Valentine’s Day activities or not – have a sweet day today. 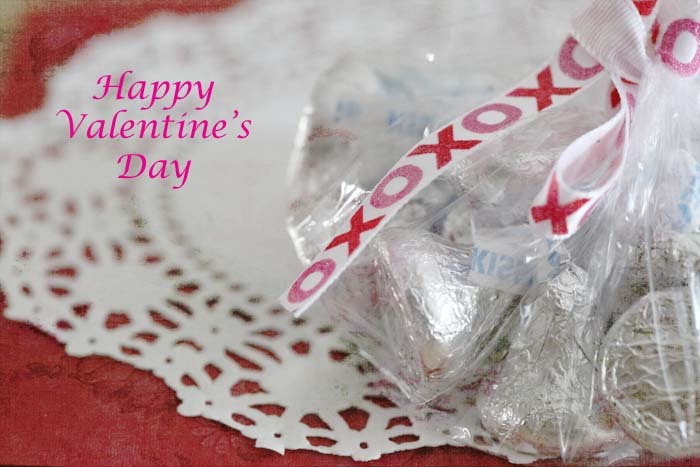 This entry was posted in musings, photography and tagged candy, musings, photography, Valentine's Day. Bookmark the permalink. Sounds like one yummy dinner on the menu this evening. Enjoy! A wonderful post, Teri. Happy Valentine’s Day to you and yours. And I hope yours was wonderful too. TD: Your V-Day meal sounded extremely scrumptious and very similar to ours. Yes, I adore roses but I also love almost any flower that is colorful and smells sweet. So WW brought me a glorious bouquet of every flower he could locate. I am one very happy woman and have been sneezing uncontrollably since they arrived. (Poor WW — no good deed goes unpunished.) But I’m loving their beauty through my watery eyes while I pop allergy pills! Happy belated V-Day to you. Poor thing! I hope you are feeling better and that next time there won’t be any sneezy flowers.